I’ll show you how I did it and all for about $15 a planter box! 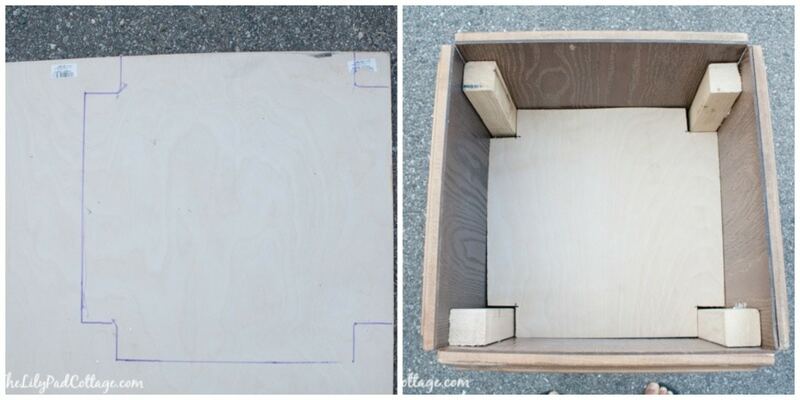 First up to make these Cabinet Door Planter Boxes you need to find 4 cabinet doors that are all the same size. I found these at a local thrift store for $1 each, they had a million of them. You will also need a couple of 8 ft 2×2’s (I used 3 to make 2 boxes), a 1×2, and a scrap piece of plywood. A few power tools are in order as well! I used my Craftsman Evolv Brad Nailer, Craftsman Orbital Jigsaw with LED Work Light, and Evolv Circular Saw. I found them all at my neighborhood Ace Hardware, they are always great at helping me figure out which tools I need for my projects. I have to say, I have really enjoyed working with Ace and learning more about power tools from the helpful people there. I’ve had several of you leave comments for me saying “now I just need to talk my husband into building this for me” but seriously if I can do this, you can too! I really feel like I can build anything now! 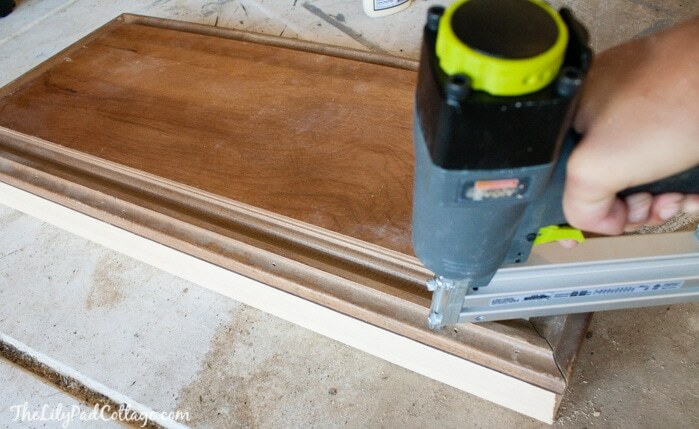 First up cut all your 2×2’s to an inch shorter than your cabinet doors. I’m not giving exact measurements since your cabinet doors will most likely not be the same size as mine. I used my new Evolv Circular Saw for this one, I love how easy and clean this saw cuts! Next up grab your brad nailer and a little wood glue. Spread the glue on the 2×2 and nail it right to the edge of the cabinet door. Repeat this step on all your cabinet doors, until you have made a square. Cut the 1×2 into small sections, they don’t have to be exactly perfect. These will form brackets for the shelf to hold your flowers. 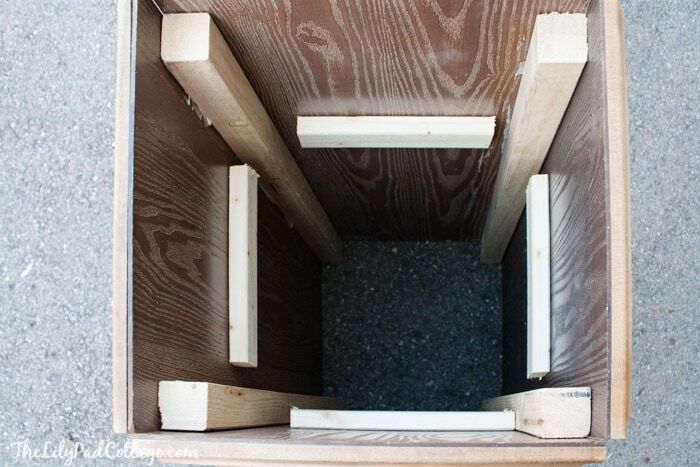 Take the plywood and trace on the inside of the planter box. I used my Craftsman Orbital Jigsaw to cut this out. Then just pop it in! Tada! Flower boxes for around $15! I painted them with 2 coats of Silent White paint by Clark+Kensington. Then I sanded the edges just a bit to bring out the details of the cabinet doors. I can’t wait to use these for my Christmas decor too! I planted them with mums, decorative cabbage, and bittersweet. I also picked up some clear hooks from Ace to hang up my basket of faux leaves and and beach grass. 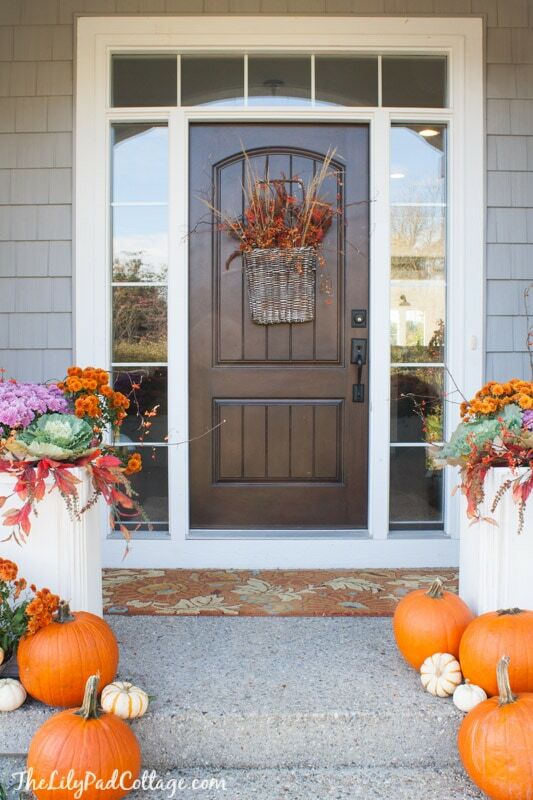 So happy my front door is all fall-ified and ready to welcome all those little trick-or-treaters soon! 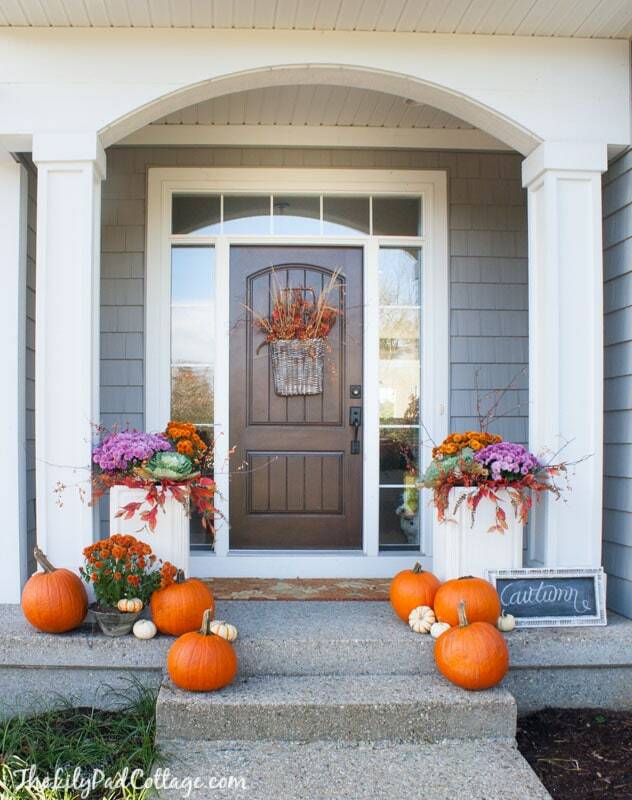 Want to spruce up your own entryway up this fall? Enter the $100 Ace Hardware gift card giveaway below for the chance to grab some power tools of your own! The friendly people at Ace Hardware will help you find the perfect ones. This giveaway will run for 1 week and the winner will be notified via email. Good luck! Disclosure: I’m a member of the Ace Hardware Blogger Panel. Ace Hardware provided me with products and compensation for this post, but all opinions are 100 percent mine. All opinions and positions here do not necessarily reflect those of Ace Hardware. Those DIY planters look amazing! I really enjoy your blog and admire your great taste for decor. They look awesome! I would love to have my very own brad nailer from Ace to help build this very project! What a clever idea! I would love a spray paint machine. Is that what there called?? a paint sprayer, I have one and love mine! Love the use of natural materials! Beautiful. I never see cabinet doors at any of my local thrift stores! Love your front porch, Kelly! I love, love, love the idea of repurposing cabinet doors! I would love to buy a brad nail gun or a new staple gun. Happy Fall! Very pretty!! Where is your fall doormat with the leaves from? Thanks! Love the planter boxes! I’d buy paint and a sander with an Ace gift card. Thanks for the opportunity. I would love to buy a new cordless screw driver! I would love a cordless screwdriver and a laser measuring device. Love the planters, and the basket on the door. I would love to have a sander. I’d like a cordless screwdriver. How creative is this. They look fabulous. Gets me in the mood to tackle my own front porch! 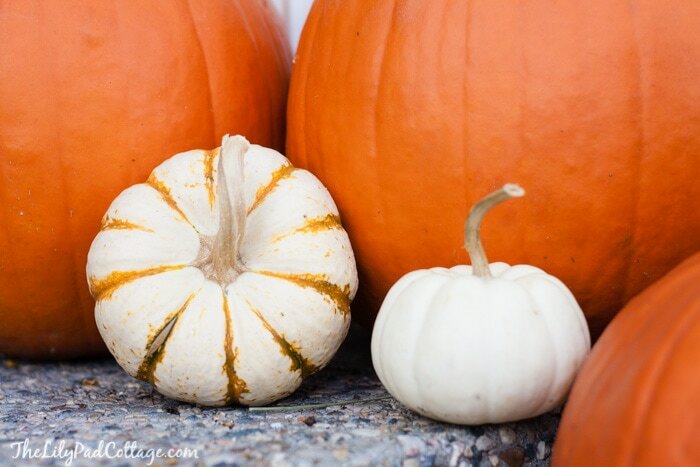 Such a cute and simple way to decorate for fall! 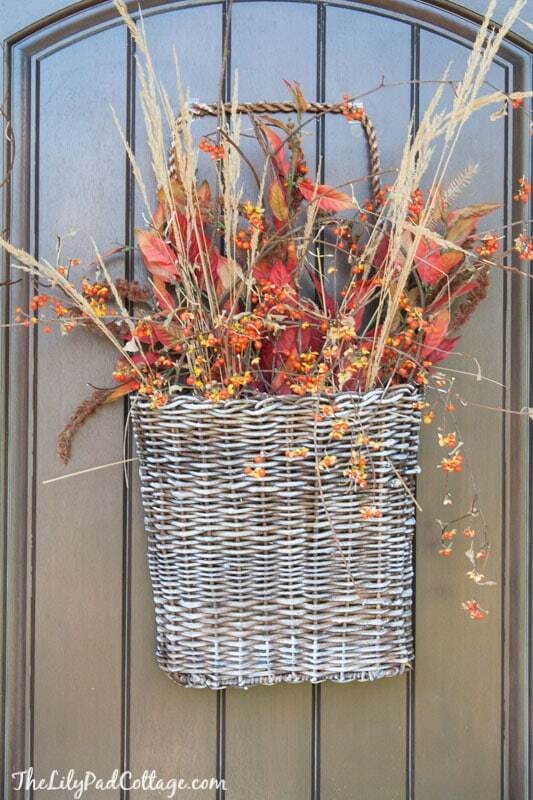 Fall is my favorite time of year and this is a great idea for the porch of my new house. I could use a new sander and / or grinder Paint Sprayer would also come in handy. I would love to learn to use power tools. Will definitely go to Ace Hardware to learn more about them. Thanks for the inspiration to give power tools a try and make something that will enhance my home and do it so beautifully! Love the planter boxes! I would love to have a lot of tools from Ace! I really need a miter saw and a brad nailer lately though. Those are adorable and look like they are really easy to make. 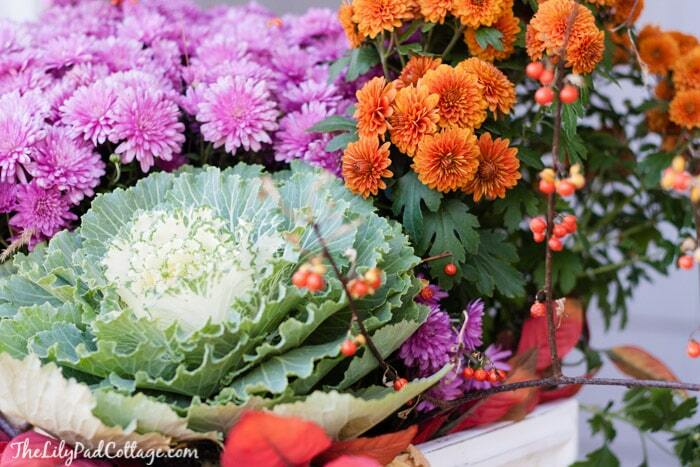 A beautiful outdoor fall display with a creative way of making planter boxes! LOVE! I just covered my front porch with wood last weekend! Now you have my wheels spinning on what to do next for décor!! Love repurposing!!! Since hub is our tool man I’d love to get him a router along with a nice table/bench area to use his tools! How cute! It looks beautiful! I love the basket on the door! Such a cute idea! I’d get sawzall, impact driver and circular saw. I really would love to learn how to use these tools so that I could do my own projects and not have to wait on someone else to help me. Stunning. I love the look of your porch. I would use the giveaway money to buy a new jigsaw. Your planters are beautiful! Ace is my favorite because I only live about 1/2 mile from one :) I need a mitre saw! I am in need of a cordless screwdriver!! Great idea! Love your new planters! I would love a paint sprayer! 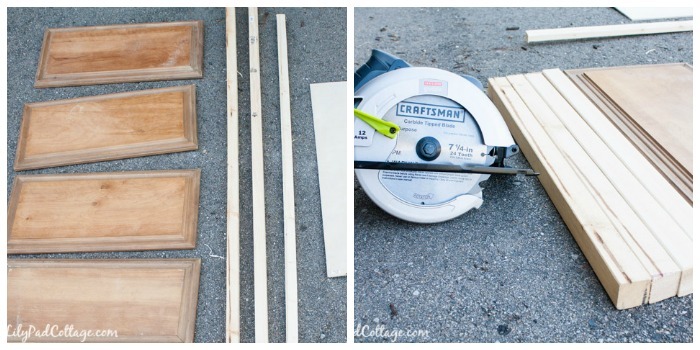 Such a great way to re-purpose cabinet doors. What a great idea and a beautiful porch. Such a clever idea! Great way to recycle old cabinet doors too. I love how your planters turned out! I’m sure they’ll look great at Christmas time, too! I’d love to buy a brad nailer at Ace! What a great idea! I know exactly what to make my daughter for Christmas. I would use the gift card to get a nail gun to help with the project. I’m so excited!! What a great idea! Definitely heading to Habitat Restore this weekend to find some cabinet doors. I would love to have a brad nailer for lots of projects (including this one)! Doing a lot of reservations on the house. This would come in very, very handy. Those are awesome…a circular saw would be incredible! 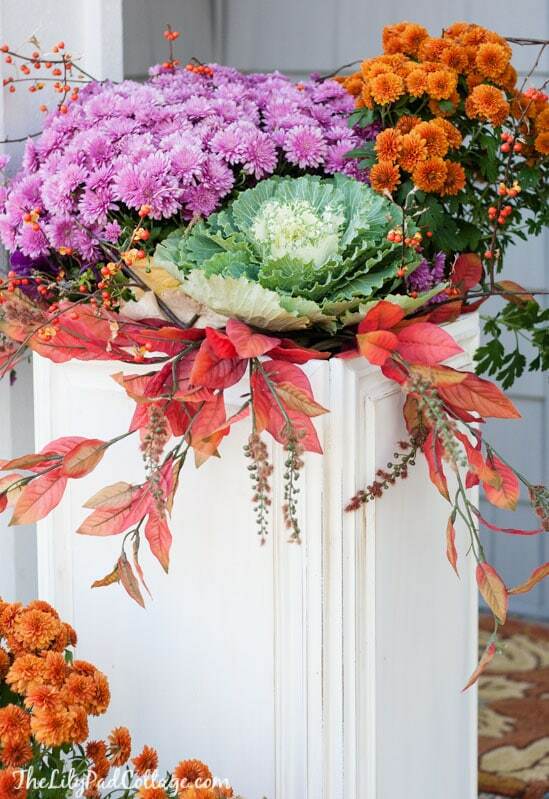 What a creative idea….I never would have thought to reuse old cabinet doors….absolutely love it…..love the fall colors also. I’d love to get some nice painting supplies, a good paintbrush that I can reuse as well as tape, gloves buckets etc….I really need to start painting my son’s room. 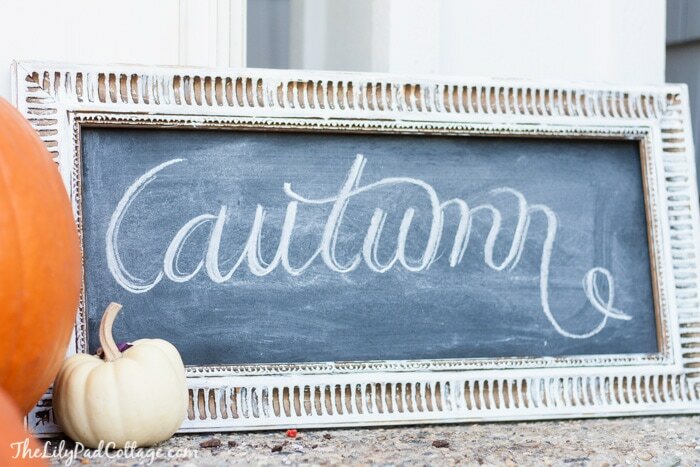 Love your fall porch so fallish!! Would love to have an electric small saw! so pretty! I love how easy it looks! I actually just asked for a circular saw for my birthday (today) so we will see if I have to get my own. I’m trying to get more handy, so this would be great! Love these planters. Your porch looks adorable. I’m always to scared to decorate my front door because it seems to be a breeding ground for spiders. Maybe that’s just a northwest thing?? Curious if you put a false bottom in before planting? I can’t imagine you filled them completely with dirt. Oh I love your fall decor ideas! I love looking at your blog and getting home ideas :) We are making our house our home slowly but surely! I would love to get a nail gun and jigsaw from Ace! I would love a paint sprayer for the many DIY projects I do at home. I’m a big fan of the Valspar paint brand. I also could put to good use a new miter saw. My hubby can’t believe we have worn our old saw out! ACE is great and love Lily Pad for your beautiful inspirational projects. Love your from porch and would love to win! Love these planters – you are so creative! Love the planters! There are so many things I would love from Ace. A circular saw, a cordless drill, nail gun and more! I don’t know about tools, but I’d love to get some paint for our dining room. They look amazing! Love the idea of re-purposing cabinet doors, so creative! I can always use a new rake. One thing I am going to buy for sure from Ace is a product called wet and forget. They are the only retailer to carry it, and I have heard it works great. Love the planters, Kelly! What a great idea. I love how resourceful you are….. Thanks Barbara, such an easy project! What a great idea! ! I think I can do this..I’d love jigsaw or braid nailer…. I am just starting to build my tool arsenal! Not sure which item i would get first! I would definitely love a circular saw!! Thanks for the giveaway! Love your blog! Would like the orbital jigsaw should I win. I always win when I go to the Ace Hardware at Cinco, in Katy TX! These are awesome. Thanks for sharing them, and the giveaway! Would love to have a nail gun. What a cute idea. And they look so expensive. You have a great eye! I would love to have a nail or staple gun. It would allow me to do anything and everything! Beautiful! We’re in the process of building a home, so any tools would be wonderful! Such a great idea! They look amazing and far more expensive than what you spent! I would like a DeWalt sander. I would love to buy some new hardware for our bathrooms in our home, for some updating. Wow! Oh my gosh these are gorgeous! Seriously Kelly you did a fabulous job with these and I love the colorful flowers! Oh my gosh! 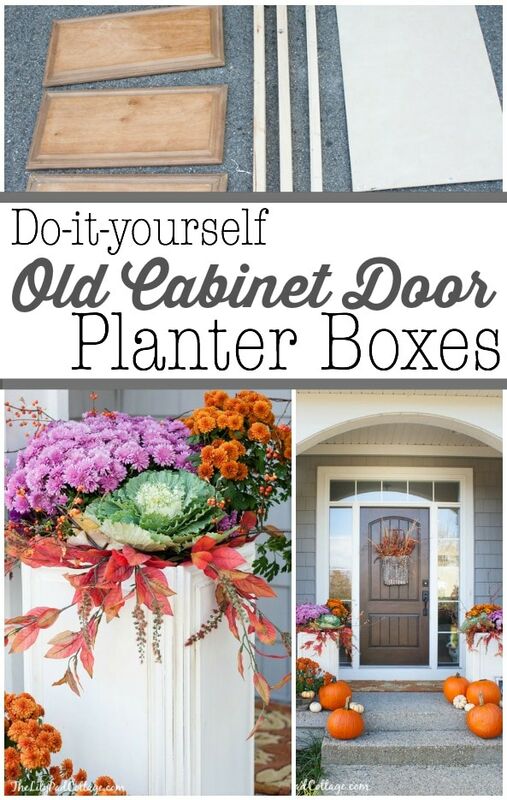 I love your planters and how you were able to repurpose those doors. Great idea! I would love to have the circular saw. That would come in handy for me! Brilliant idea! Love it so much.